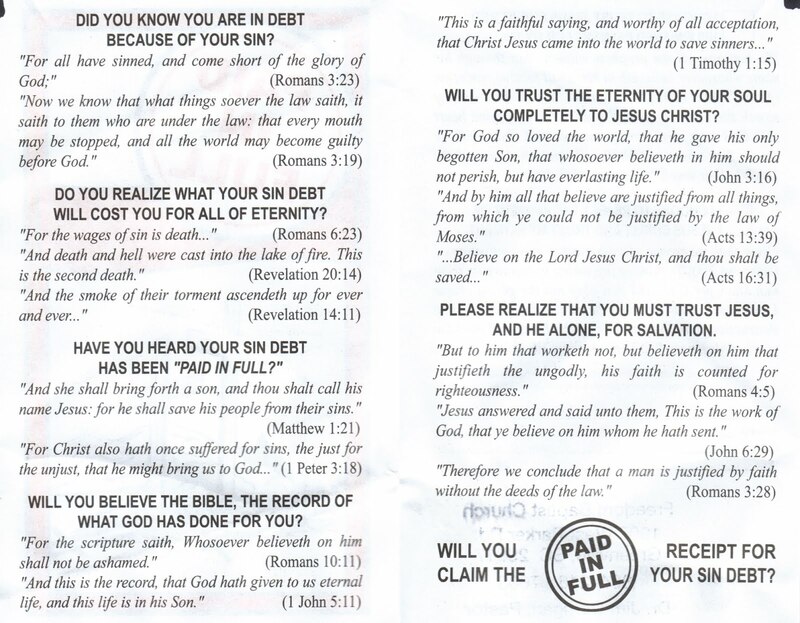 Picture right is the typical Salvation Gospel Tract found at bank ATM’s, left on tables at restaurants and ironically, in restrooms. This one was left under a wiper blade on my wife’s car at work by Freedom Baptist Church (as stamped on the back) located just a quarter mile from where she works. A. They are rambling statements from eclectic writings in the New Testament. Of the 27 religious texts that make up the New Testament, only 7 could be used to prove this point and most from a man who never even saw nor heard the earthly Jesus preach: Paul Like most Gospel Tracts, much of the sales pitch comes from Paul’s last perfected theological views , Romans. 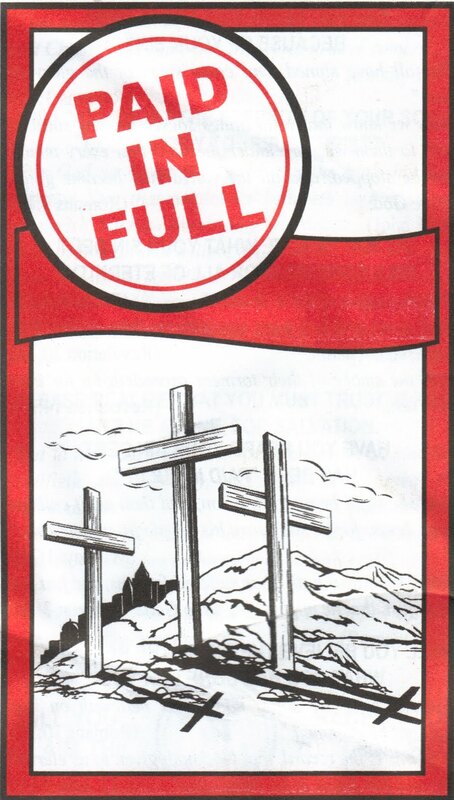 Reality proves that this salvation sales pitch is nothing more than a cut and paste theory created by the tract's author to fish for converts! B. Notice too, that nowhere does God (the one who is demanding atonement for the imaginary problem of sin) makes a single statement! C. Notice also that Jesus - the center of which the entire Christian faith built upon – makes any statements either (except a rambling statement taken from the Gospel of John made to other Jews) since Jesus hated gentiles. 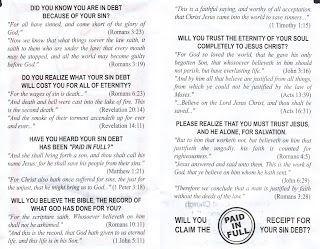 D. Finally, notice that this whole eclectic rambling sales propaganda assumes the person reading the tact understands completely the concepts of sin, atonement and salvation as found in Jewish Covenantal Theology as drawn from the Hebrew Bible! 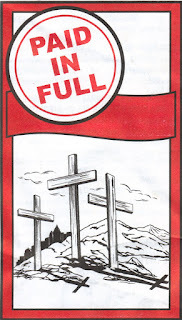 E. In short, Gospel Tracts are little more than “fishing” for human guilt trips built on ignorance. Thank you! I was raised in a Christian family, and it is always frowned upon to doubt ANYTHING written in the Bible. But I can't help it. Sometimes I still get scared that maybe I'll end up in hell. But why? Because it was drilled into my brain from the moment I could comprehend the English language. I think a lot of people only "believe" because they were raised that way and are scared of what will happen if they rebel against it. But to only believe because you are supposed to defeats the whole purpose of faith. And notice how Christians can justify almost anything they don't follow in the bible, for their own convenience. They only do what is comfortable for them. Most of them anyway.